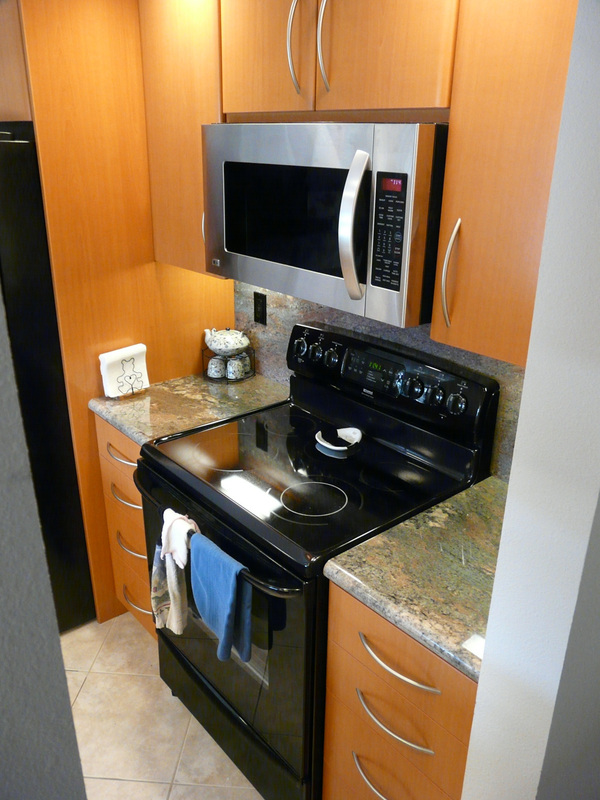 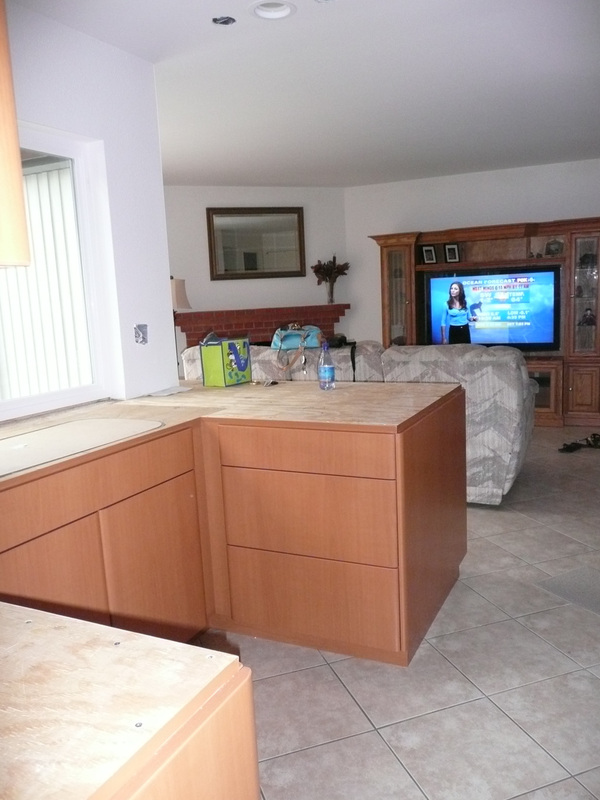 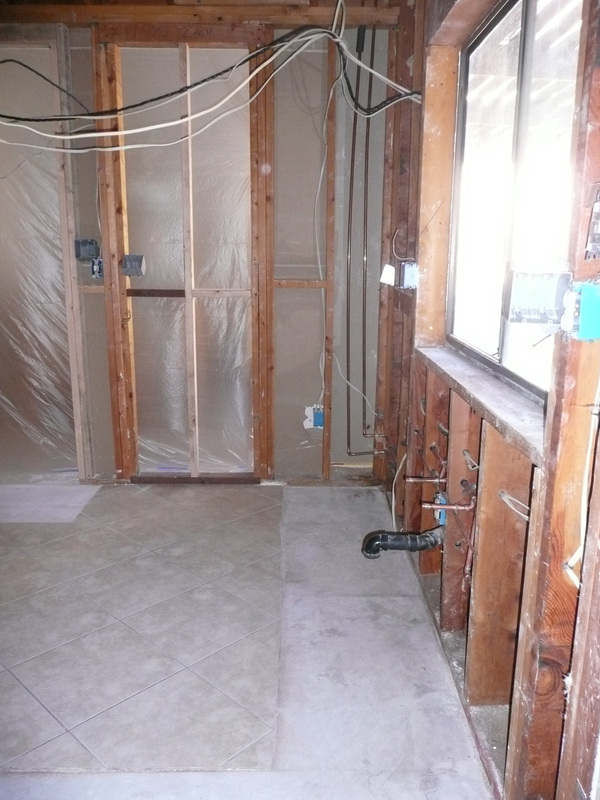 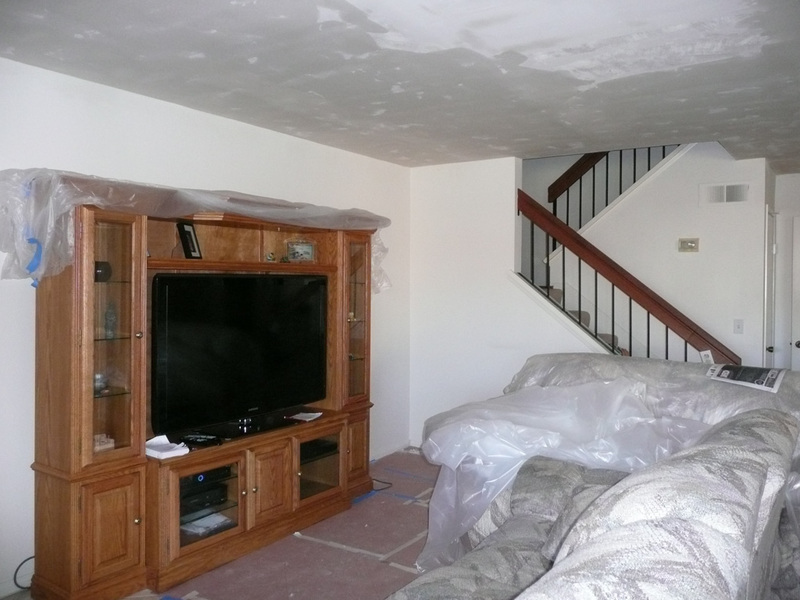 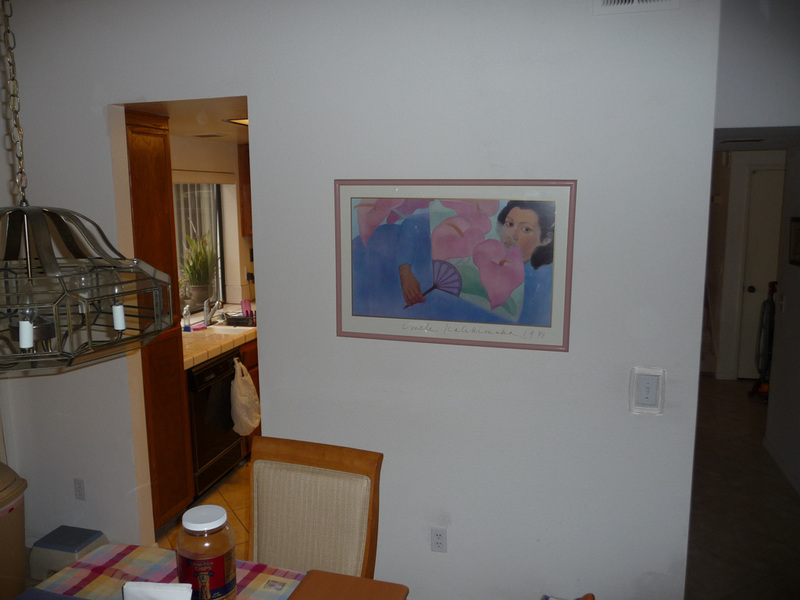 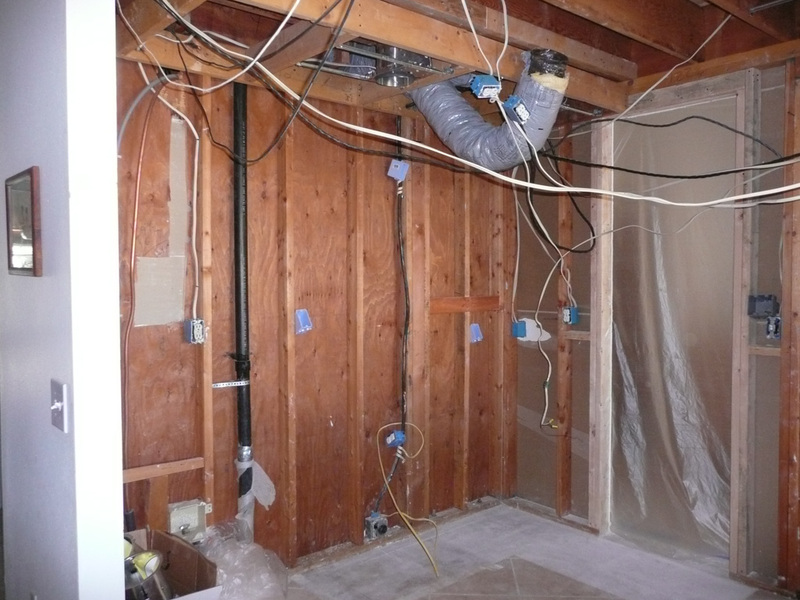 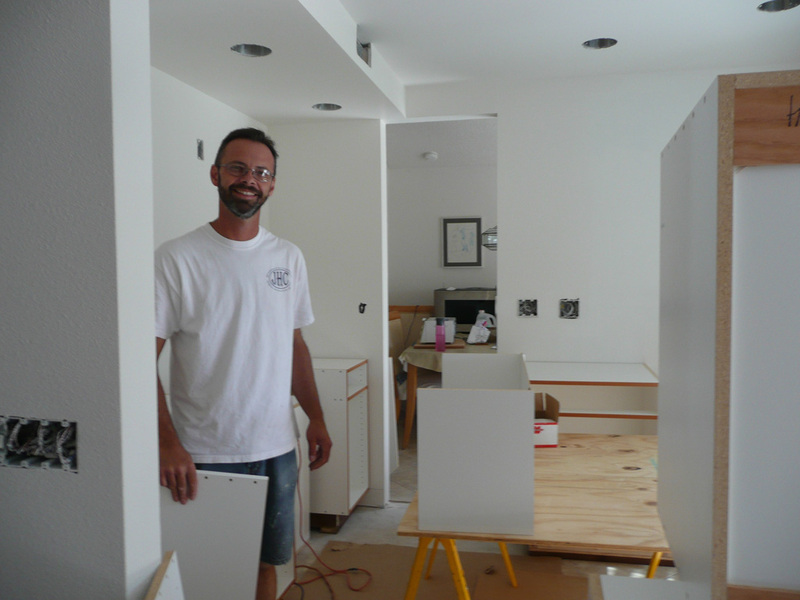 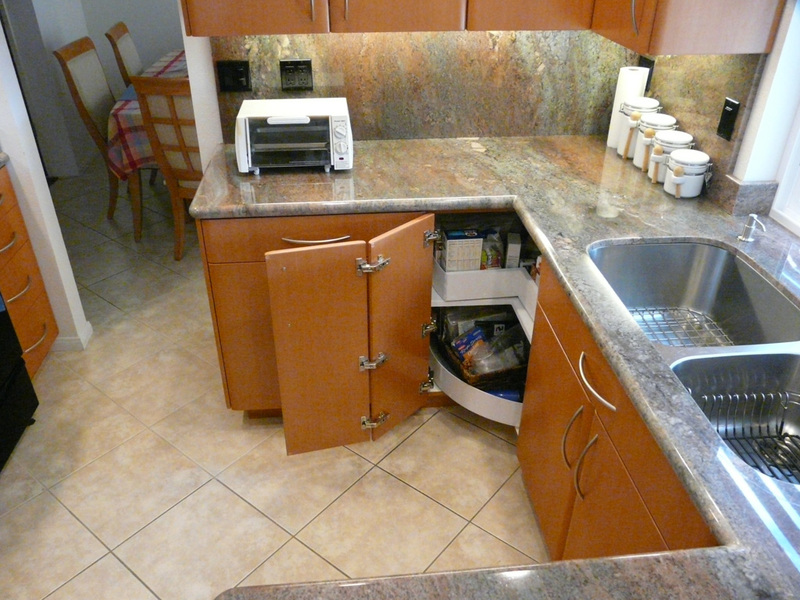 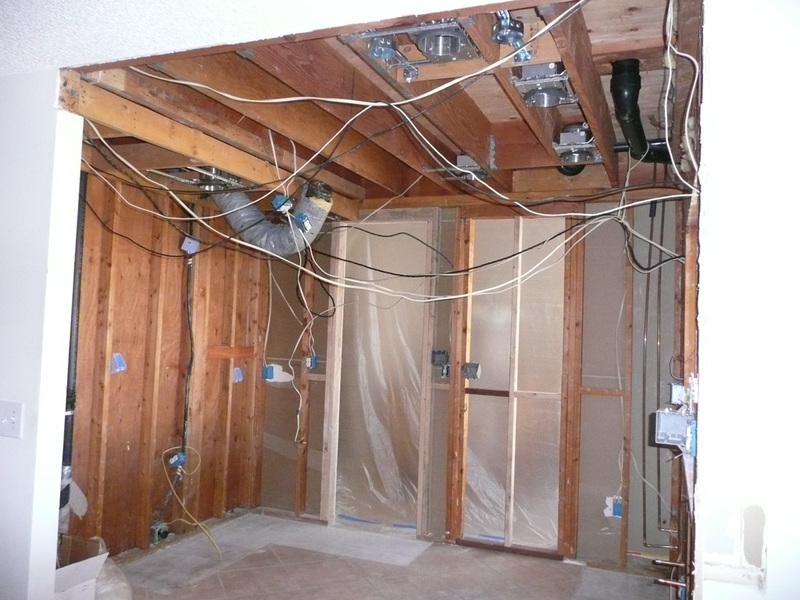 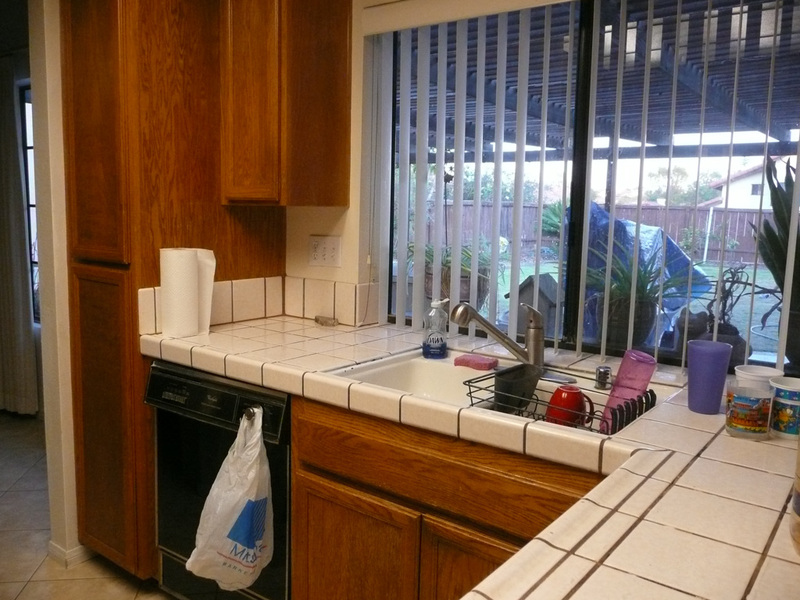 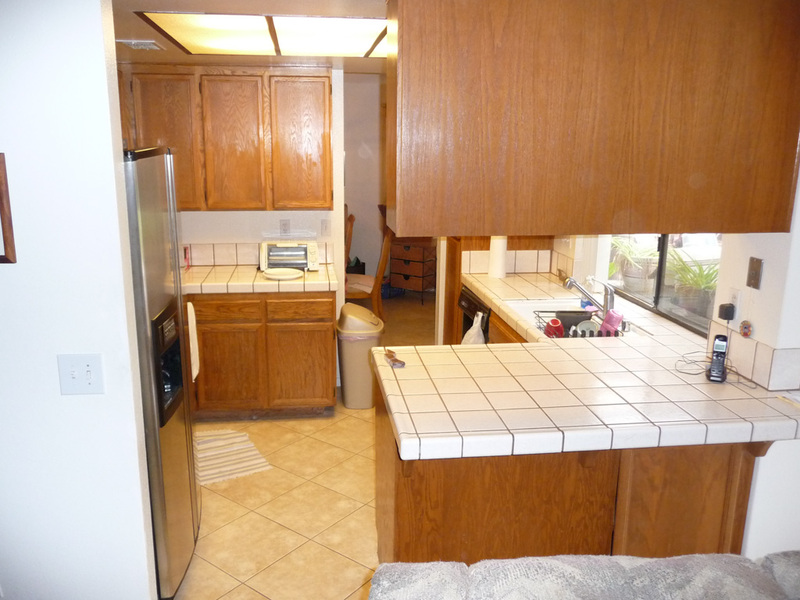 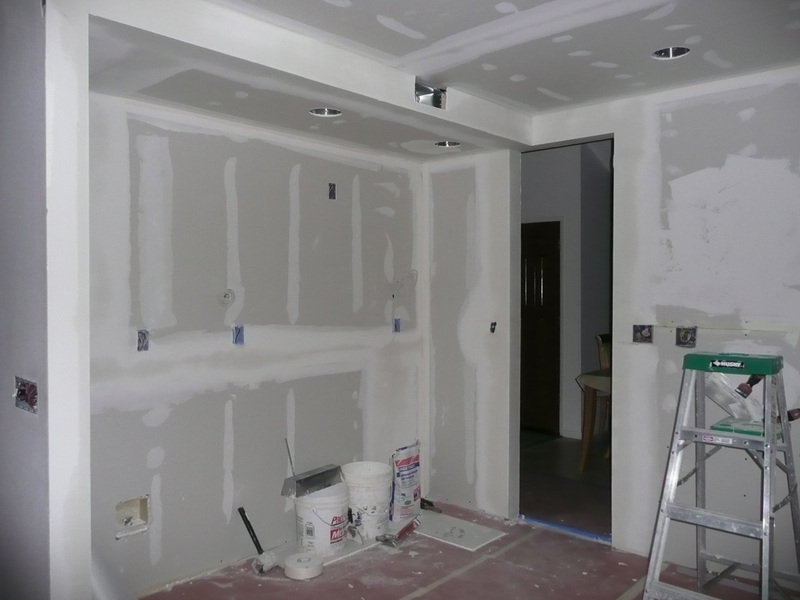 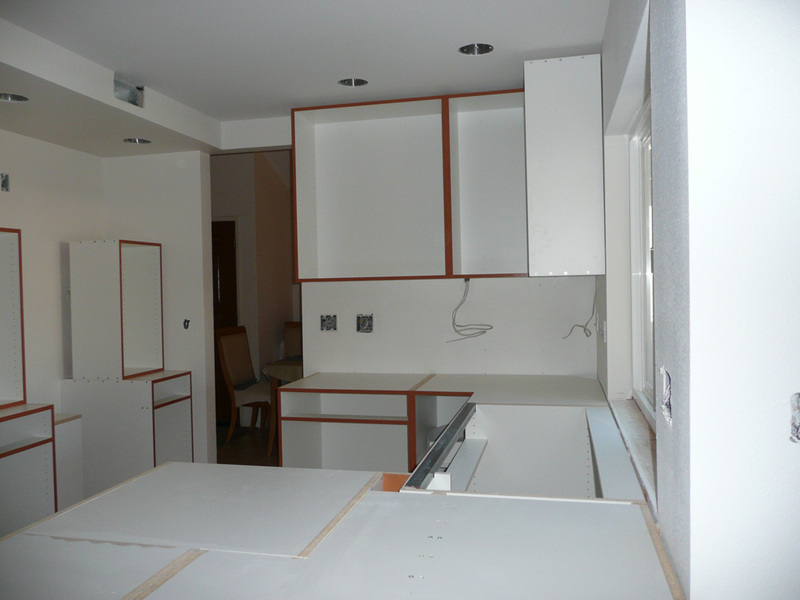 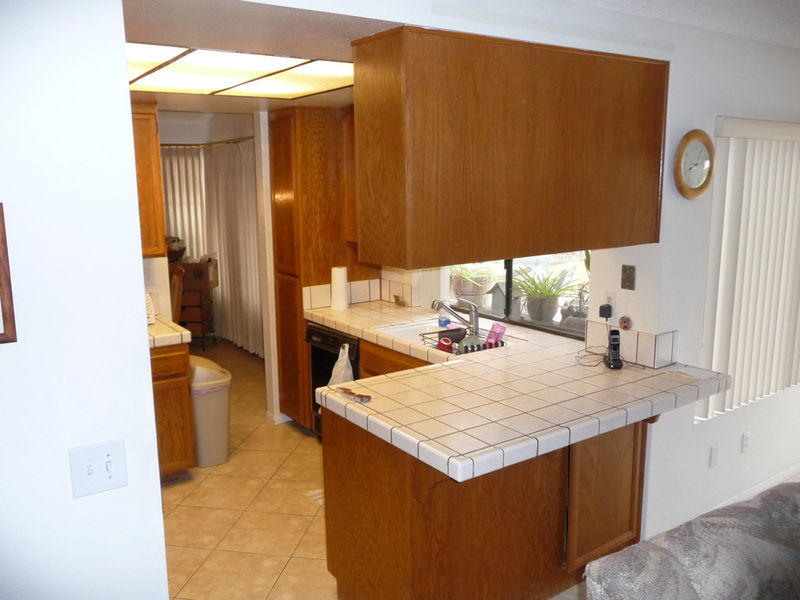 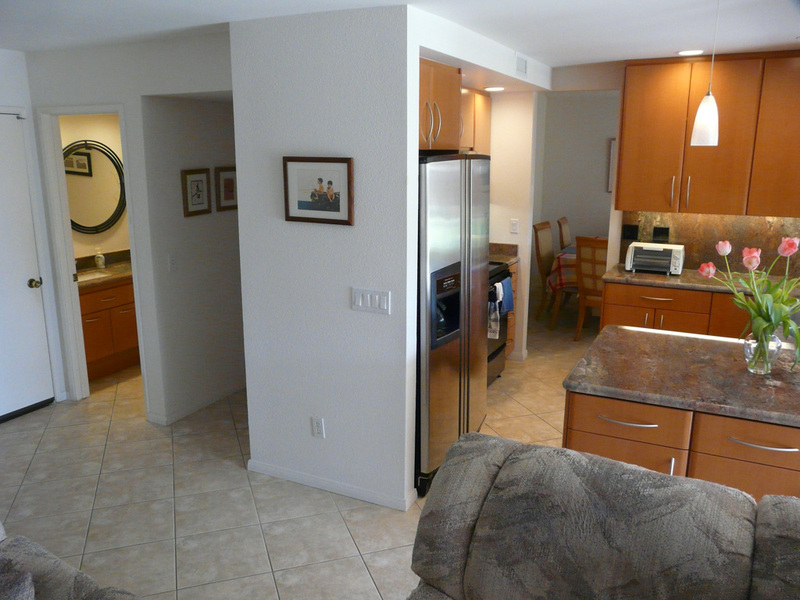 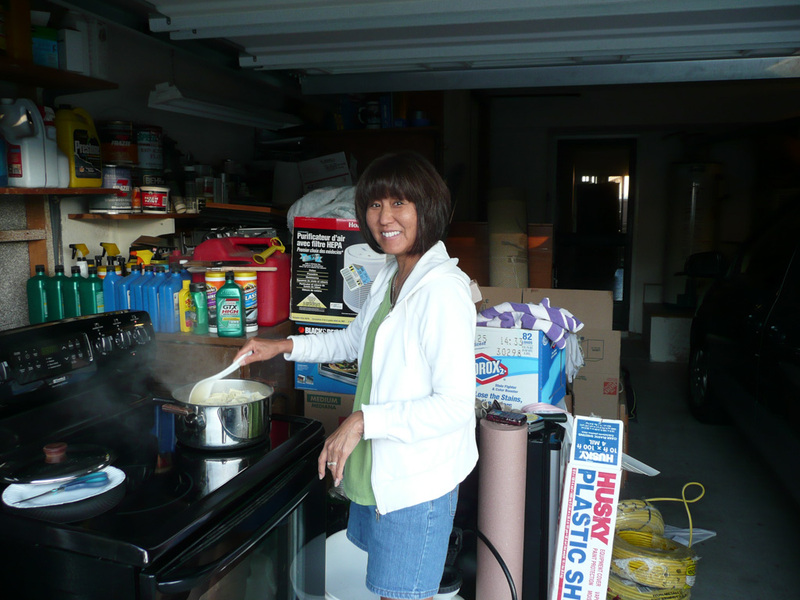 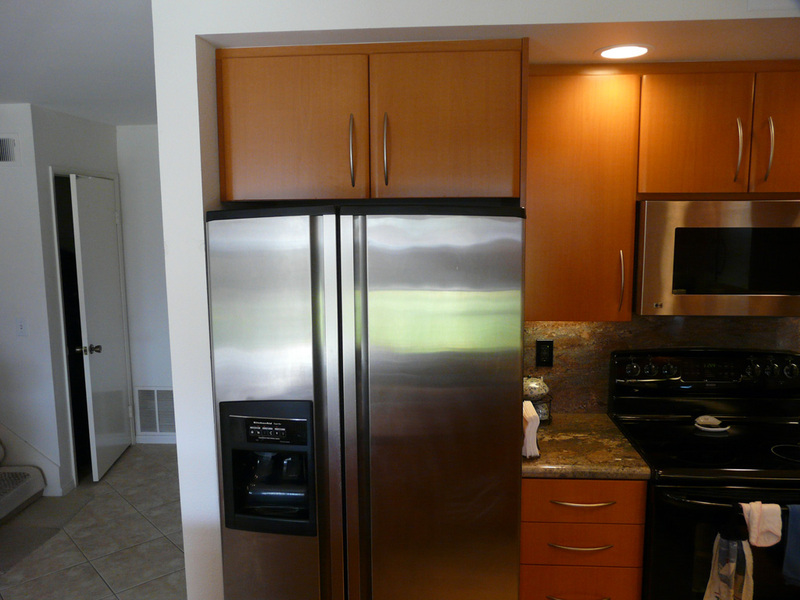 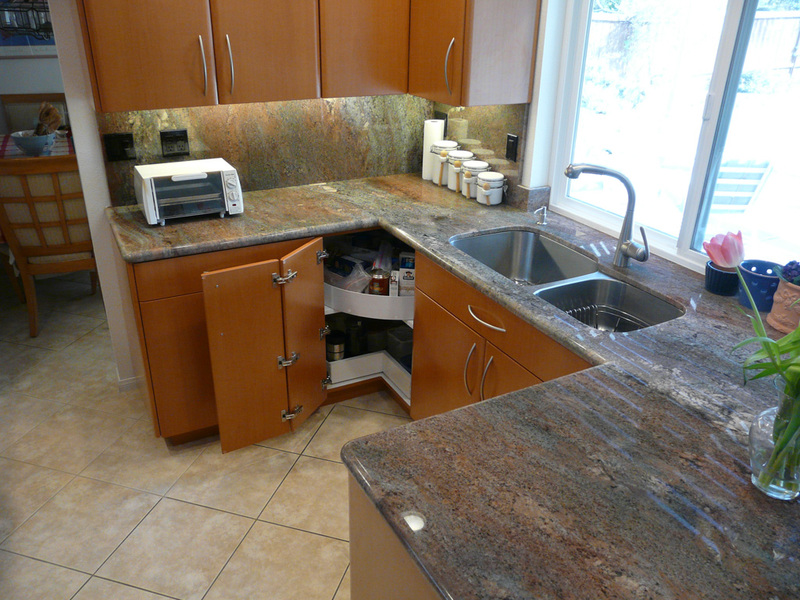 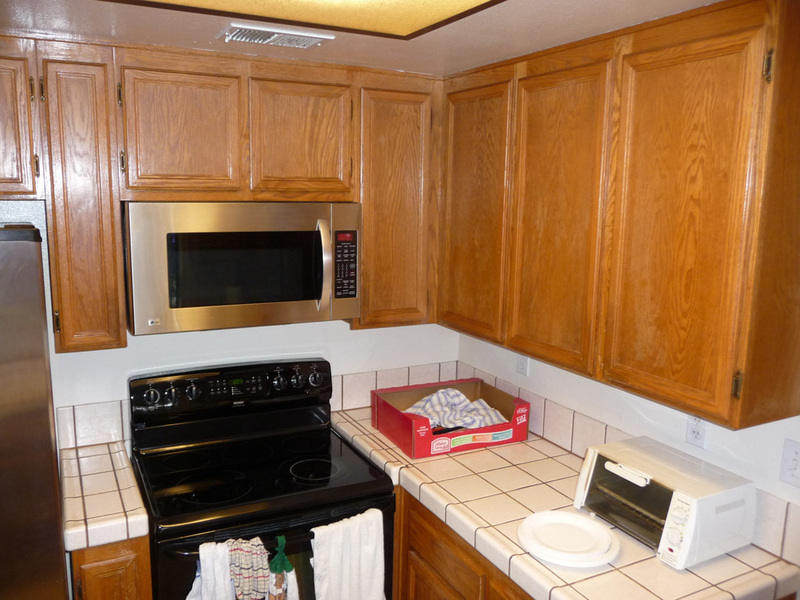 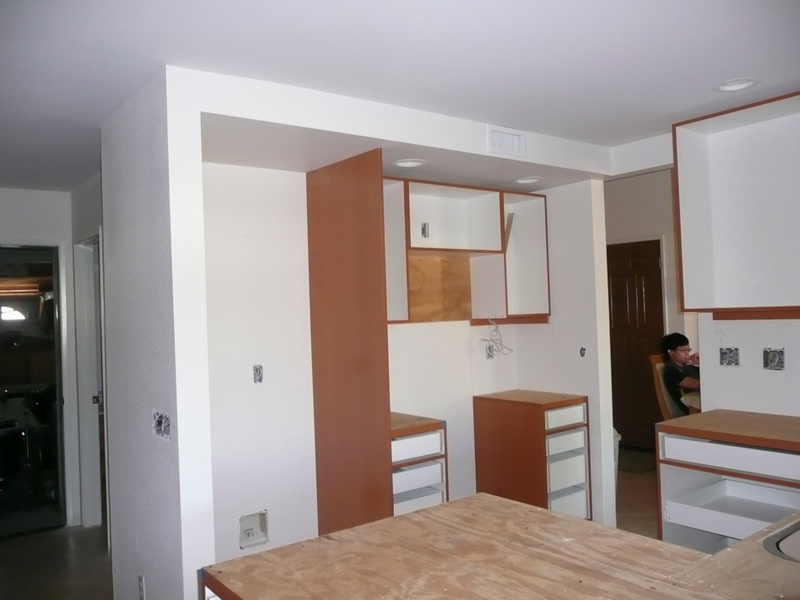 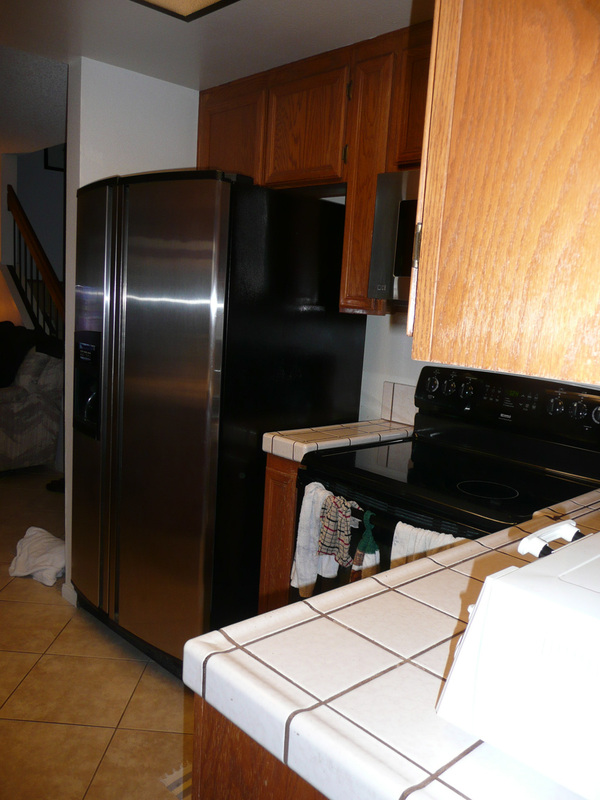 As you can see in the before photos of this tiny kitchen it was very cramped. 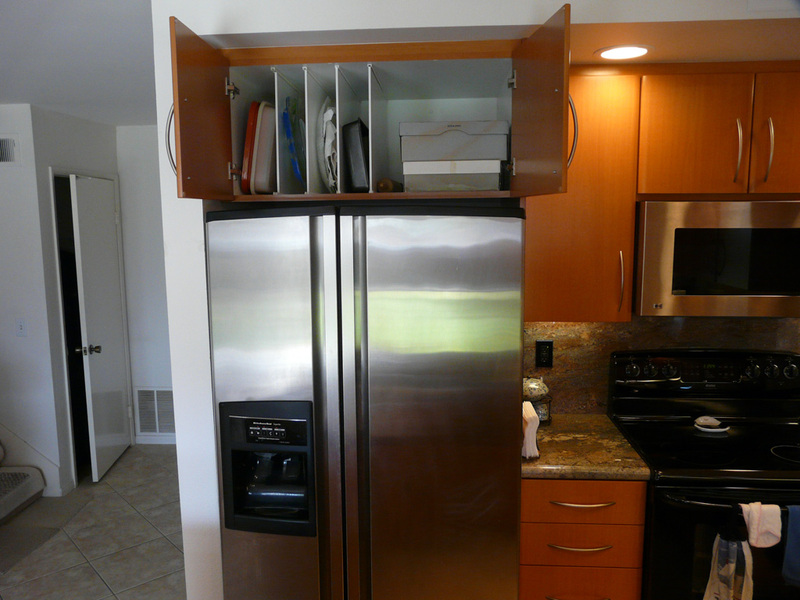 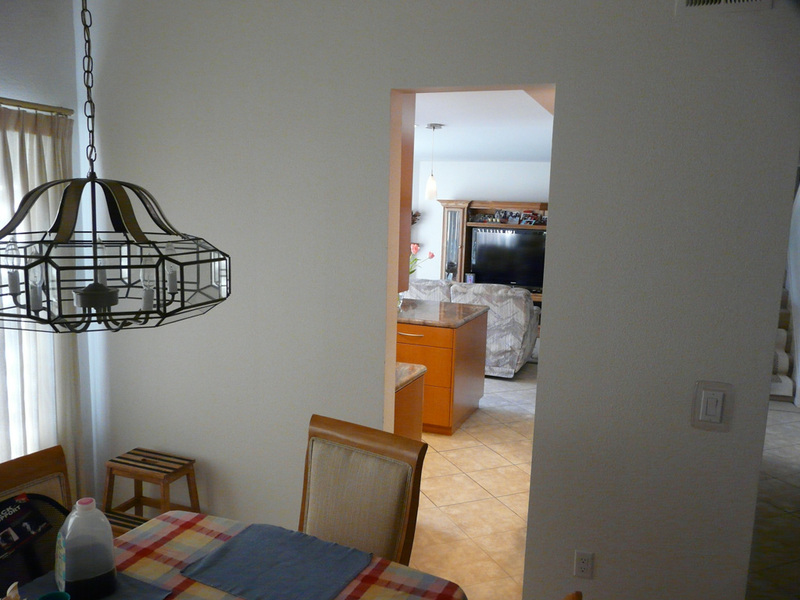 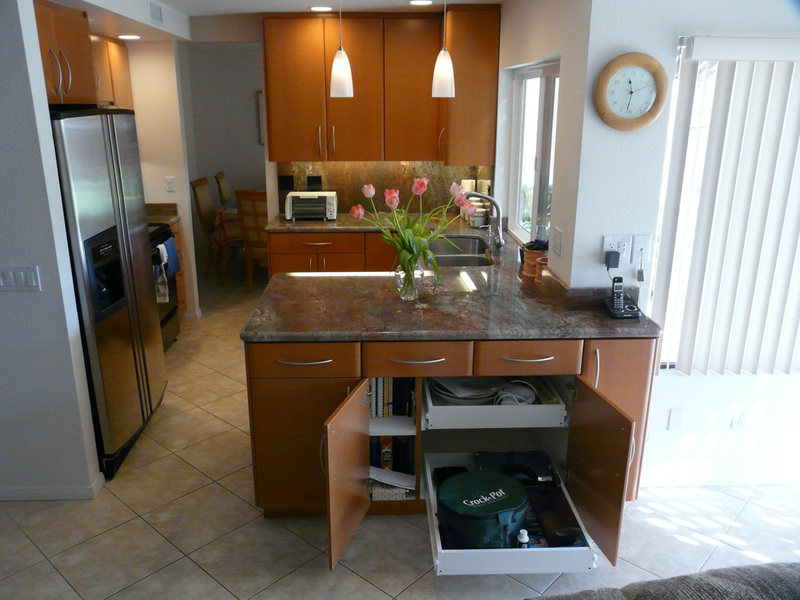 It had lots of dead space in corners which made it even more inefficient for storage and usable counter space near the cook top, refrigerator, or sink. 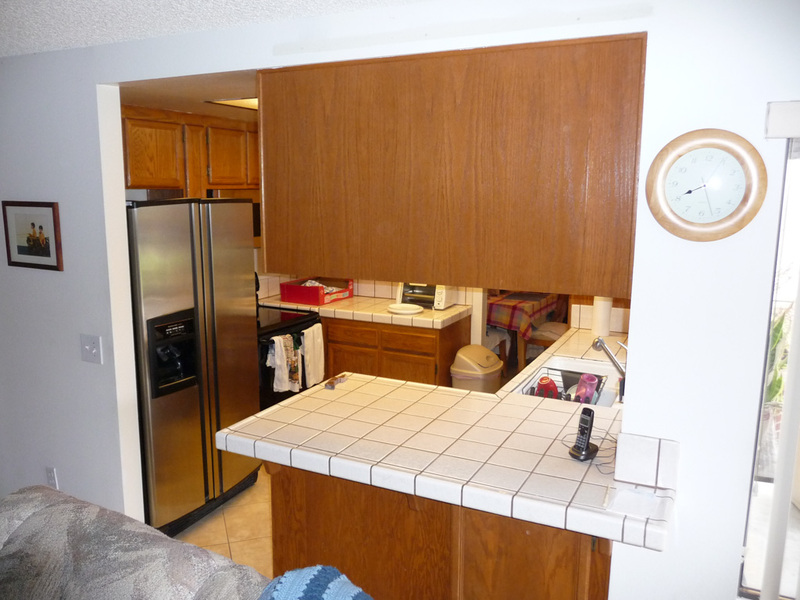 The solution entailed moving the door between the dining room and kitchen which eliminated the dead corners on the right of the range and the lack of counter to the right of the range in the original plan. 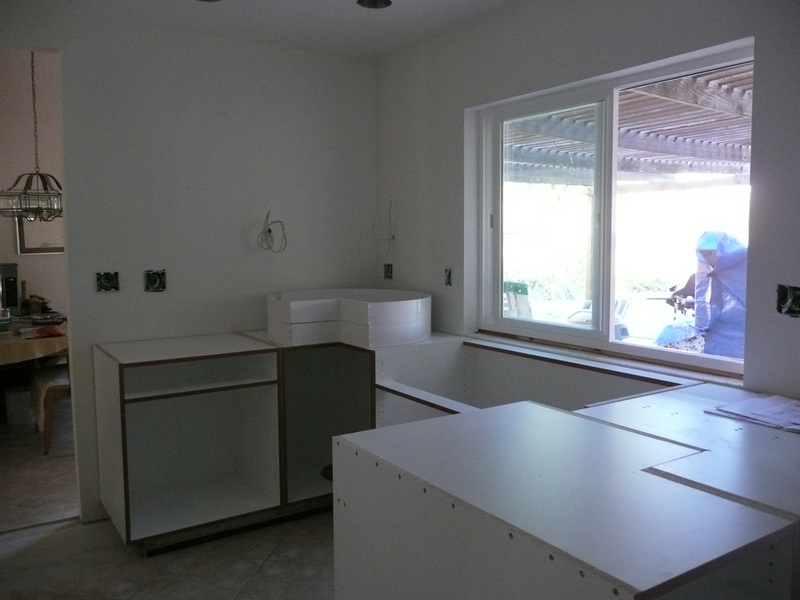 Moving this door also allowed the creation of a U-shaped work area with the sink at the center. 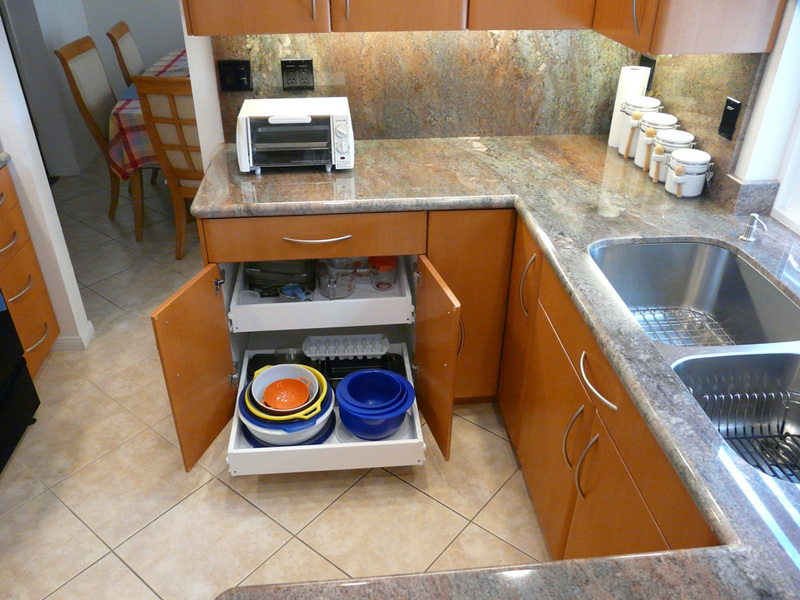 This U-system is considered the most efficient option in most kitchens. 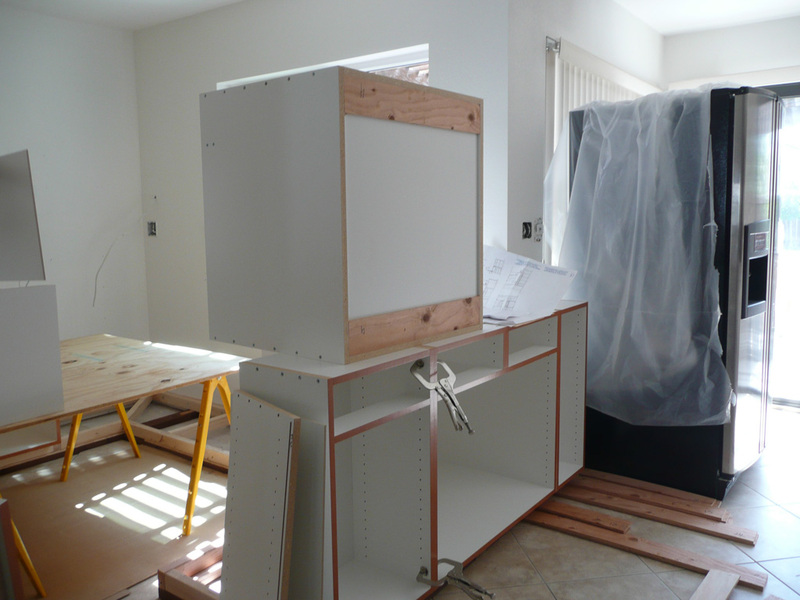 We also added storage on the family room side of the peninsula, role out shelves, lazy susans, and numerous other storage features. 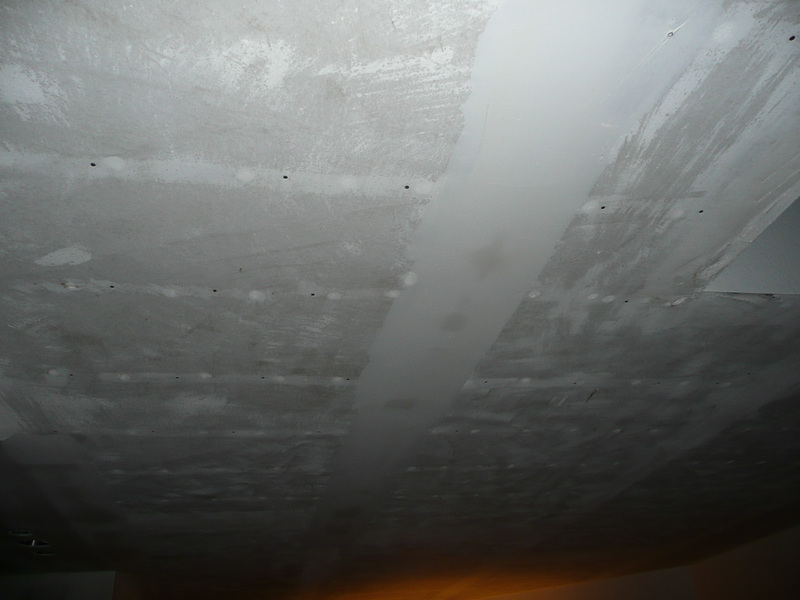 We also raised the ceiling eliminating the dropped fluorescent ceiling. 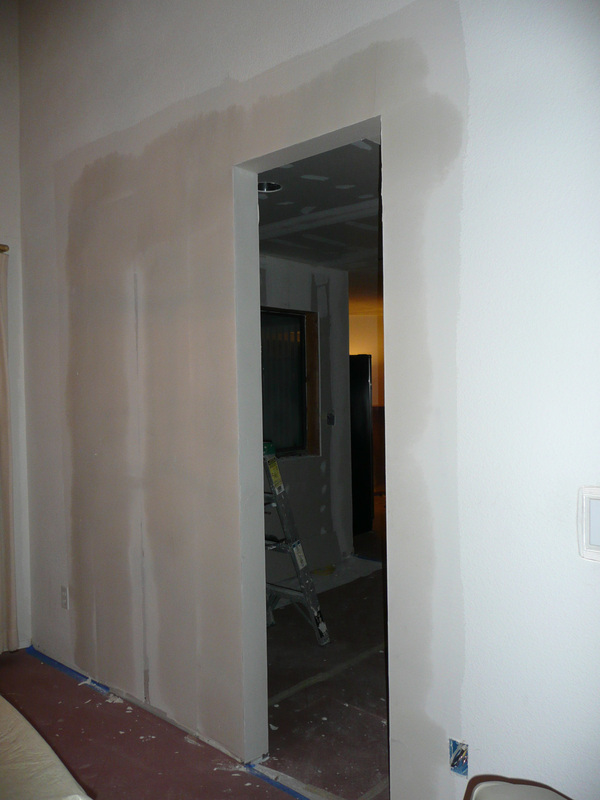 This change made the room feel and look bigger. 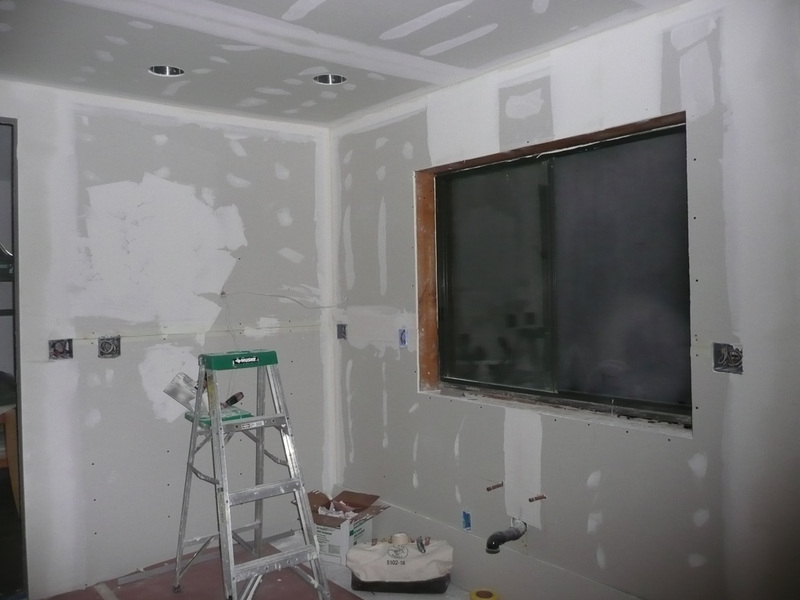 The new LED lighting we installed is far more energy efficient than the old fluorescent and will save the client hundreds of dollars per year in electrical bills. 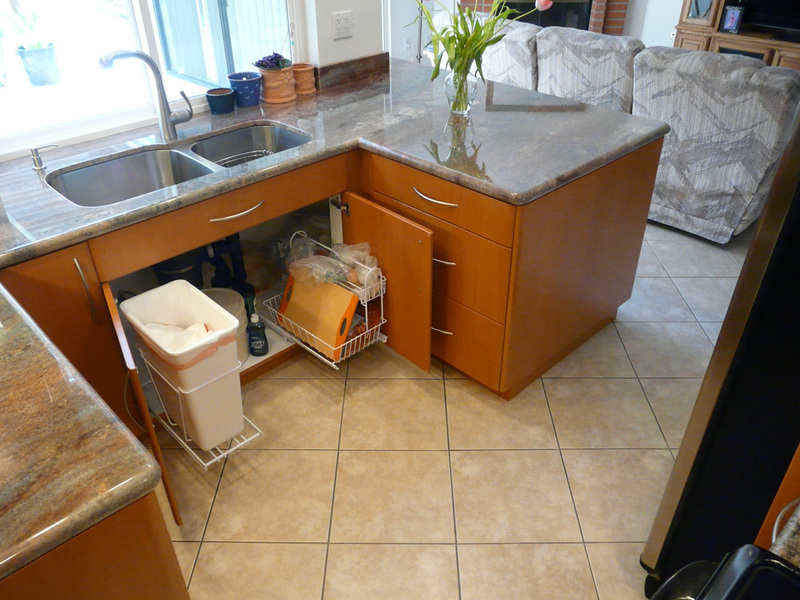 Even though we moved the door and kitchen cabinet footprint, we were able to keep the existing tile flooring by carefully popping up tiles to save them and patching in new tiles as needed. 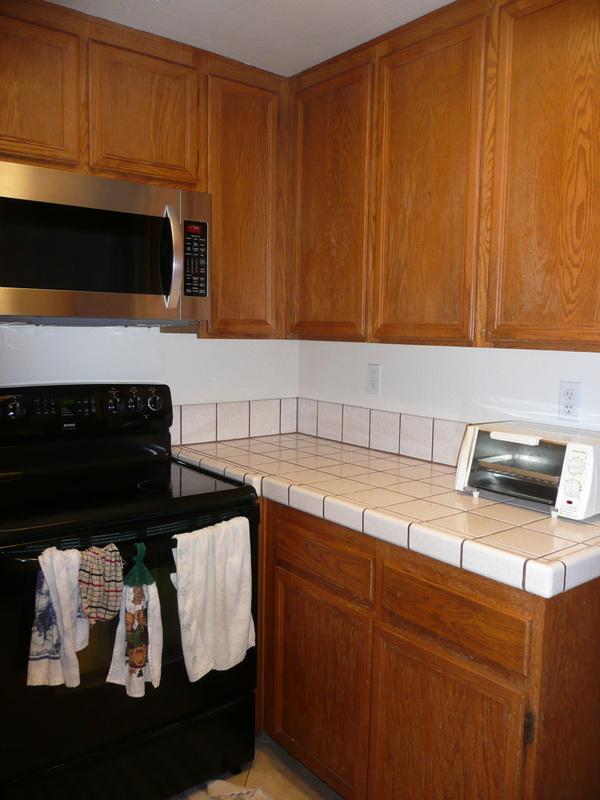 The newer grout lines in the new doorway as seen in these photos will, with time, darken to match the existing. 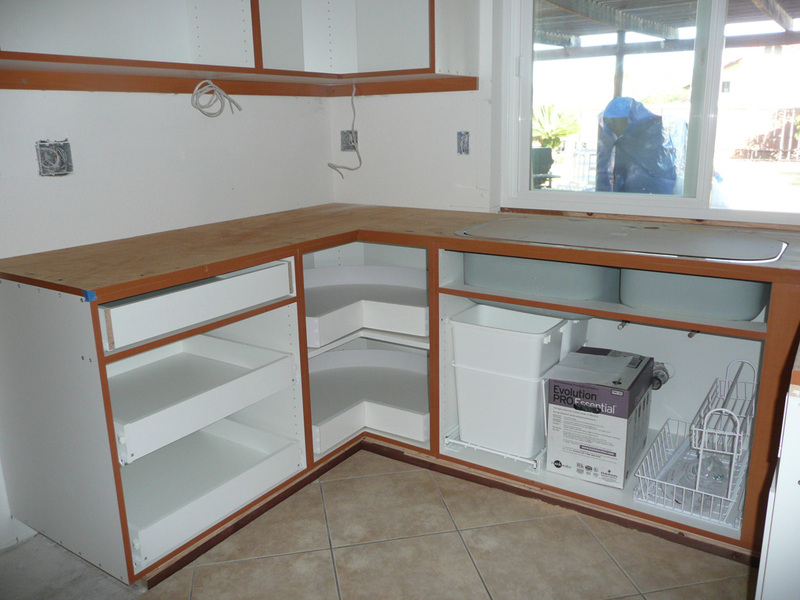 This client now has more usable storage in this kitchen than they had before even though we eliminated the wall cabinets that isolated the kitchen from the family room. 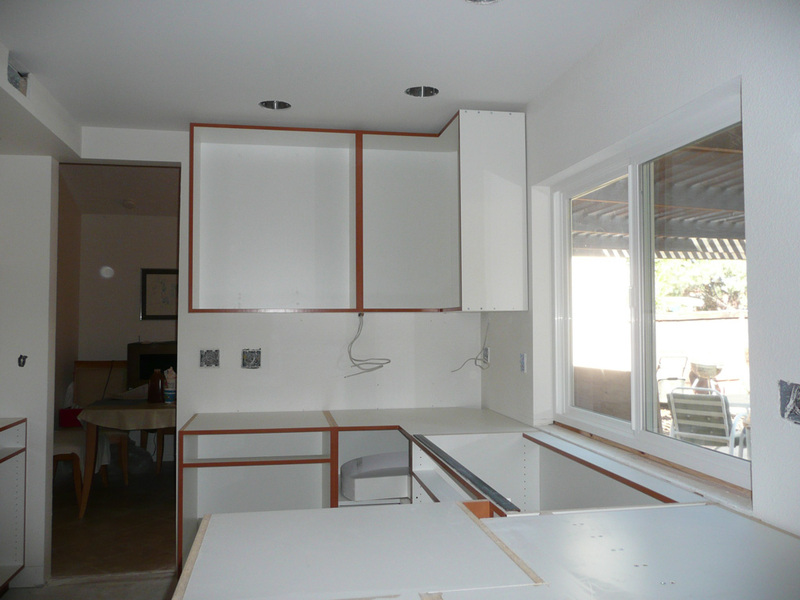 This new open kitchen plan is highly efficient and beautiful to look at as a focal point for this open kitchen family room area. 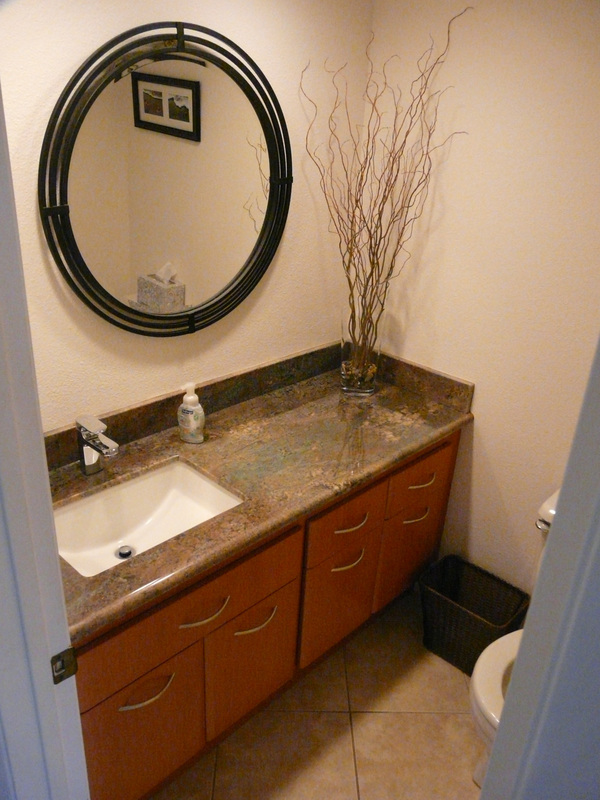 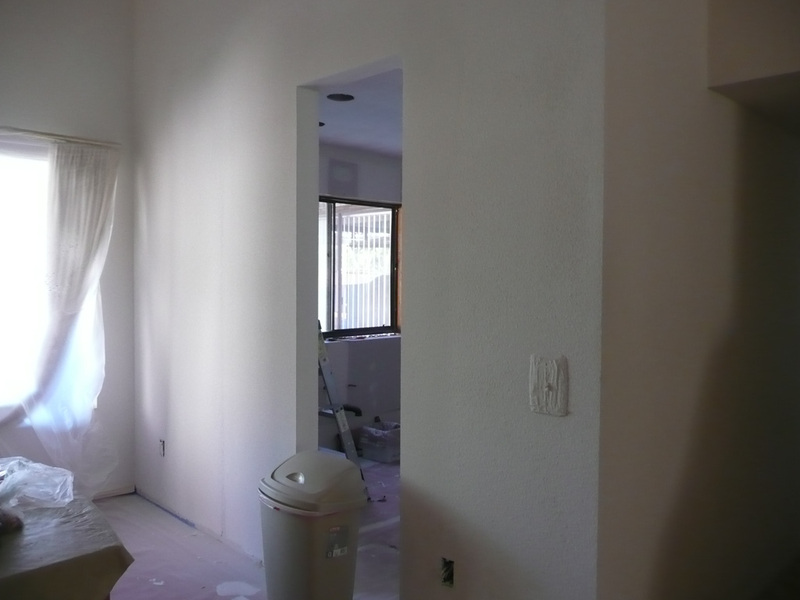 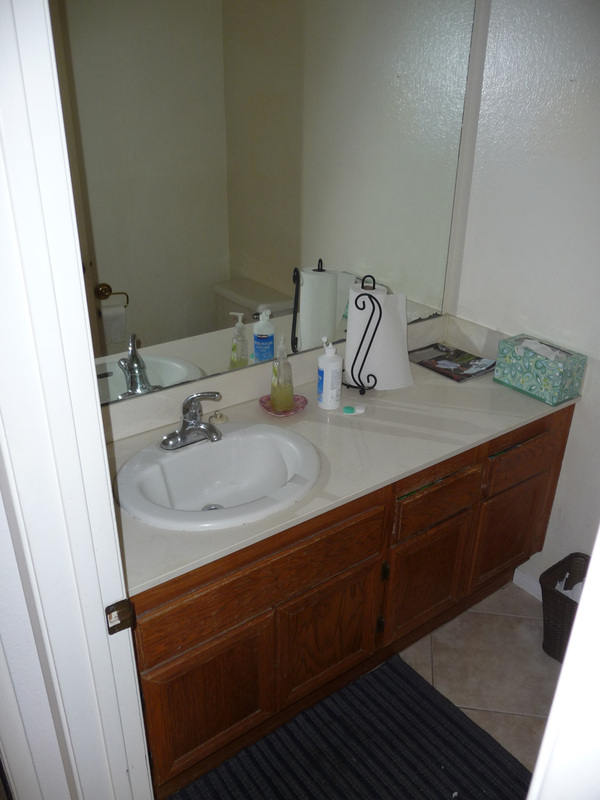 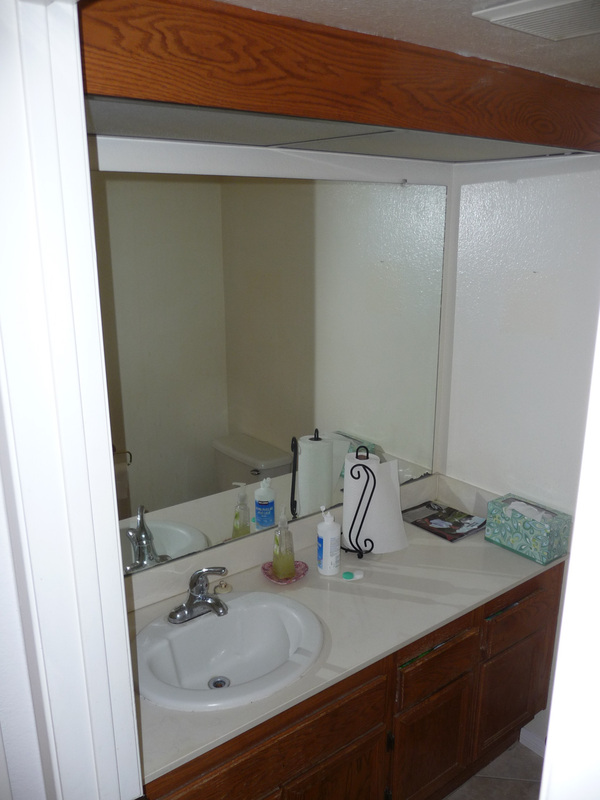 The adjoining powder room had a fluorescent light box that made a small room look smaller and darker. 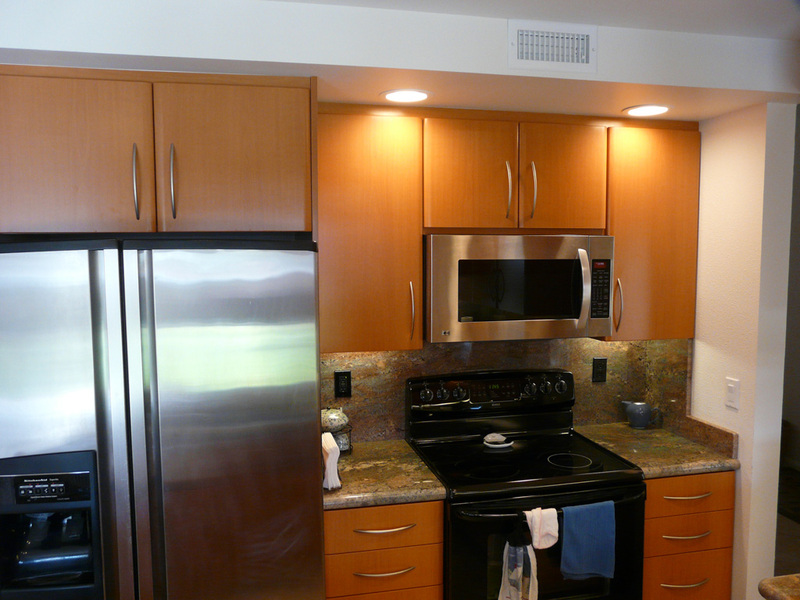 To upgrade this room so it looked as good as the kitchen, we eliminated the light box and put new LED lights in the ceiling. 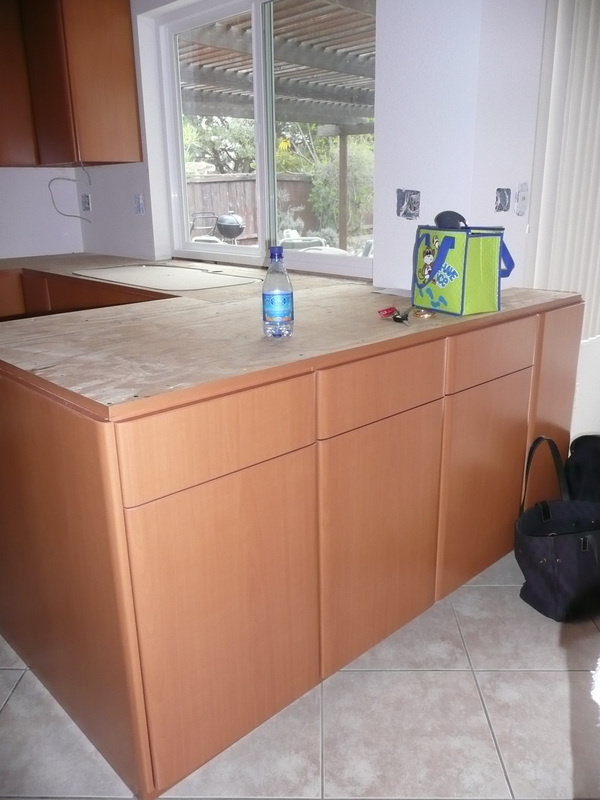 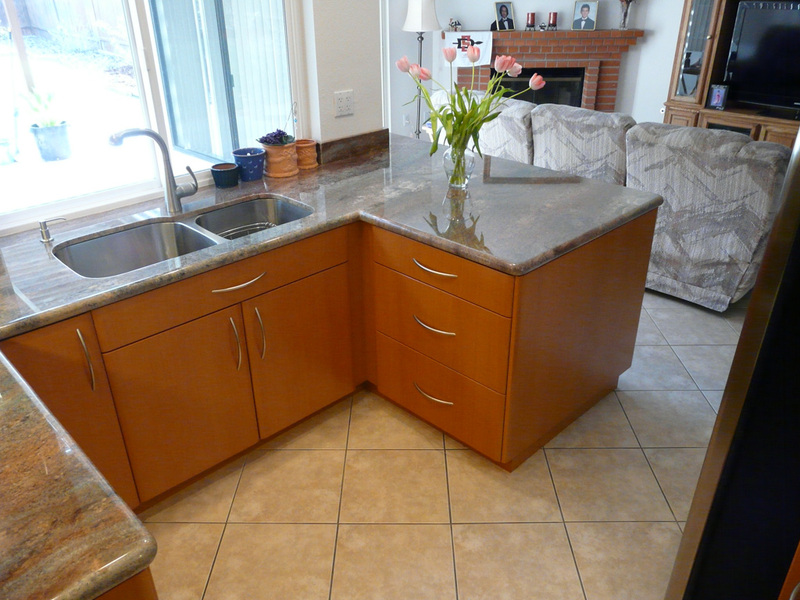 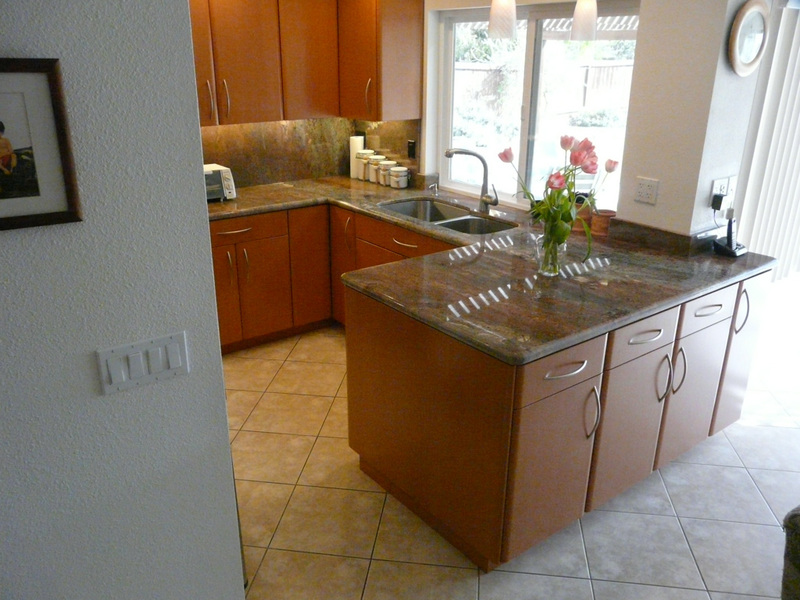 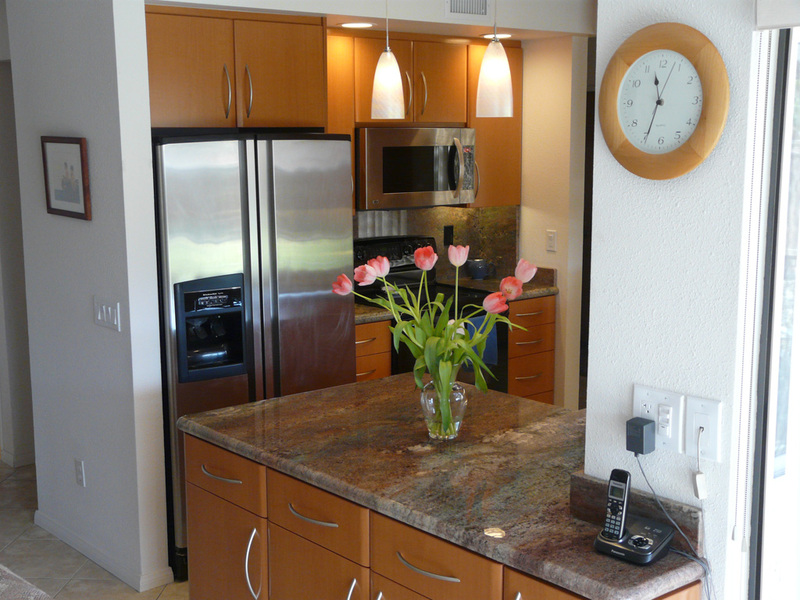 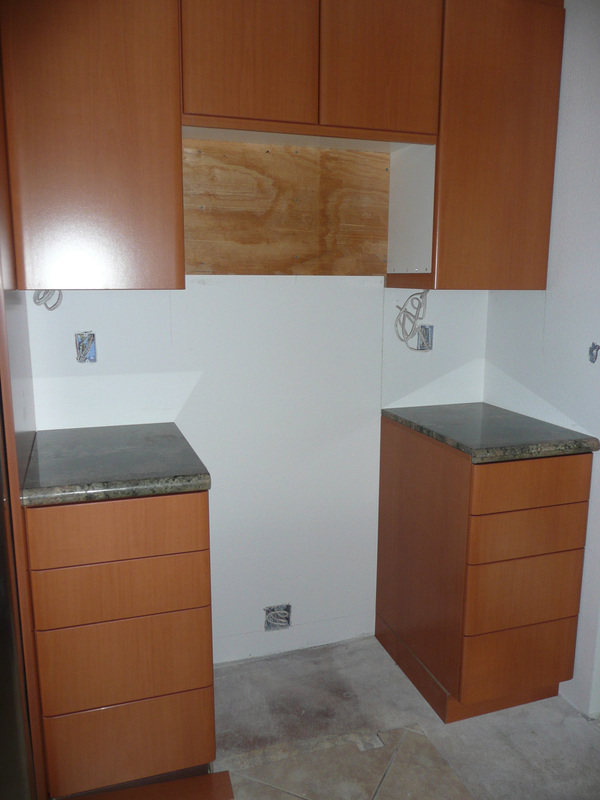 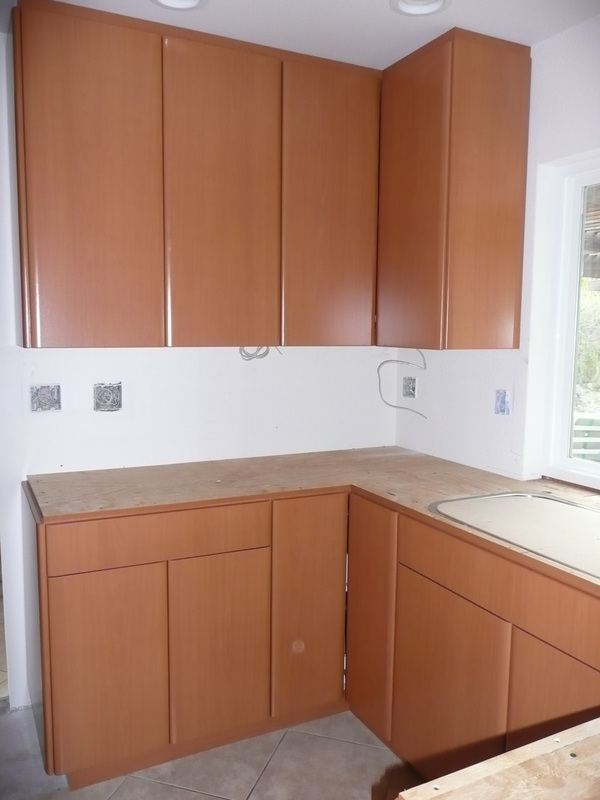 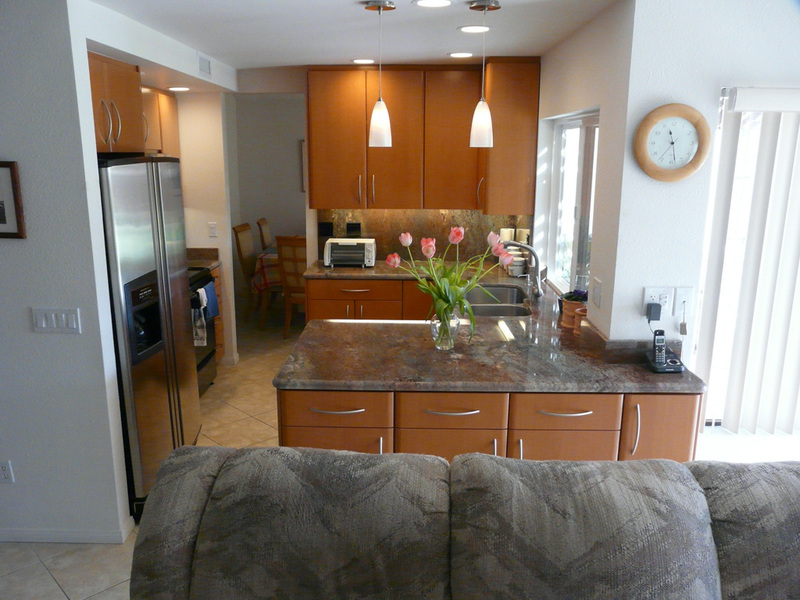 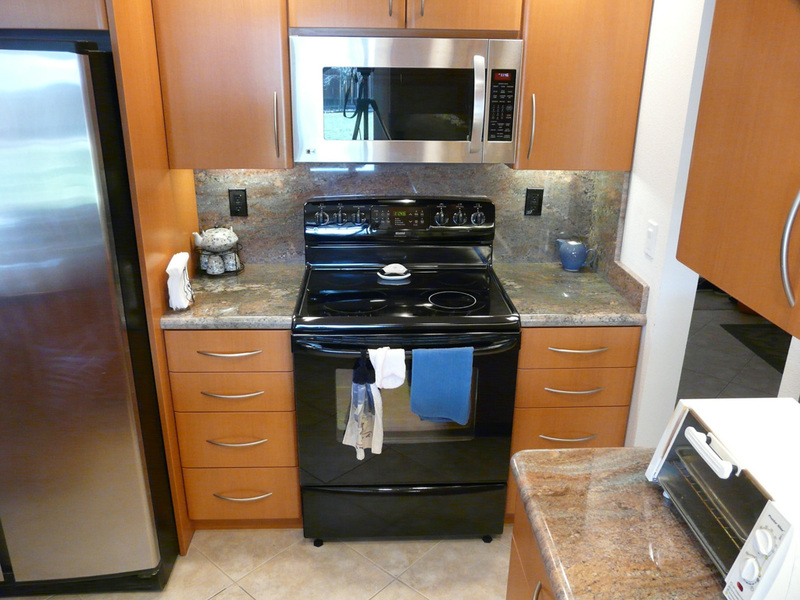 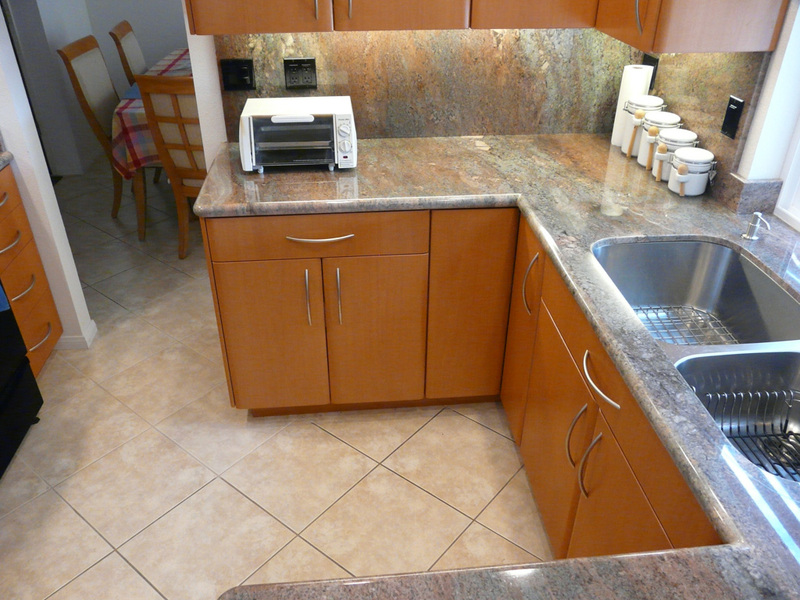 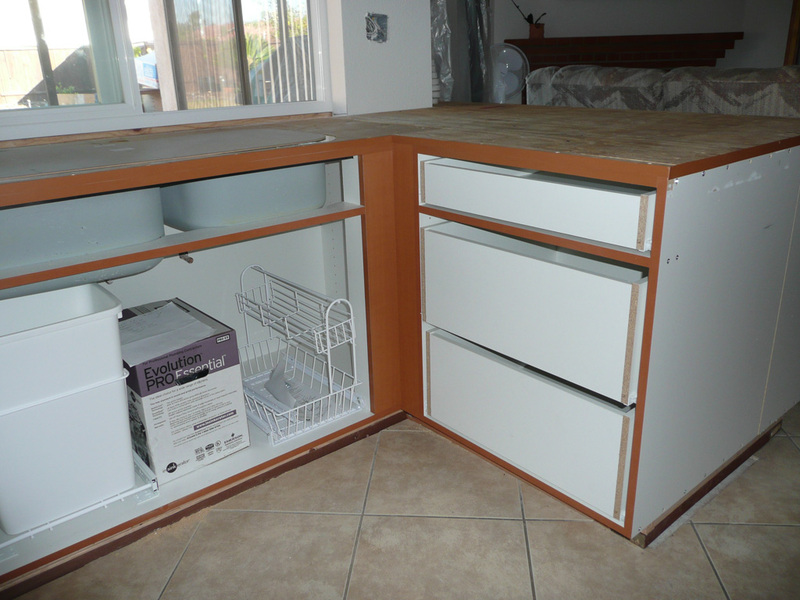 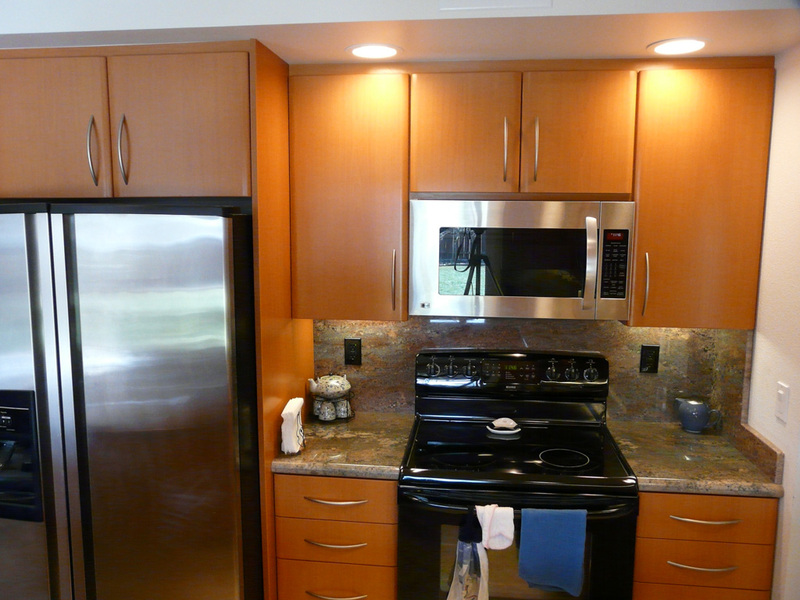 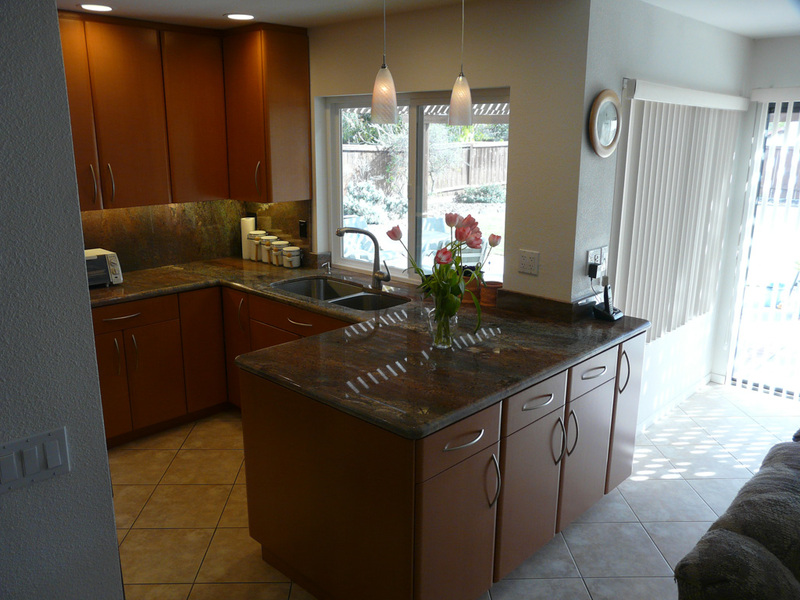 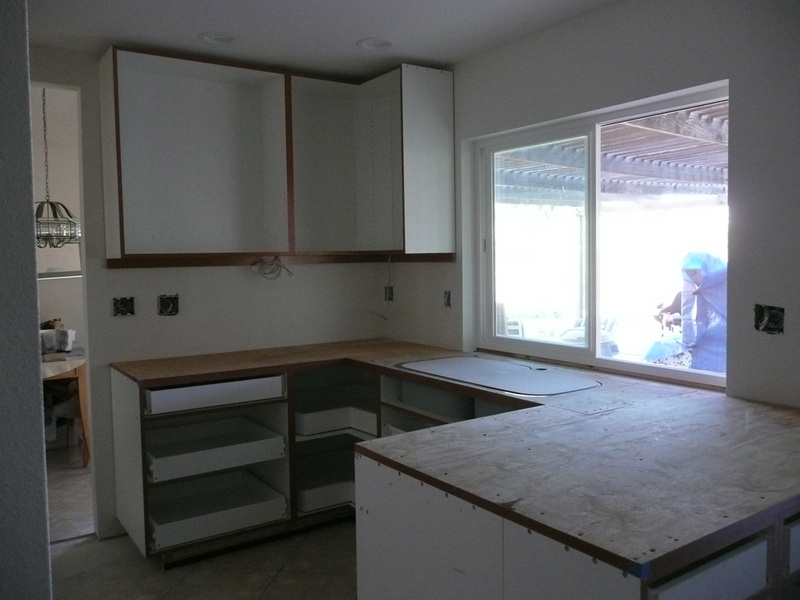 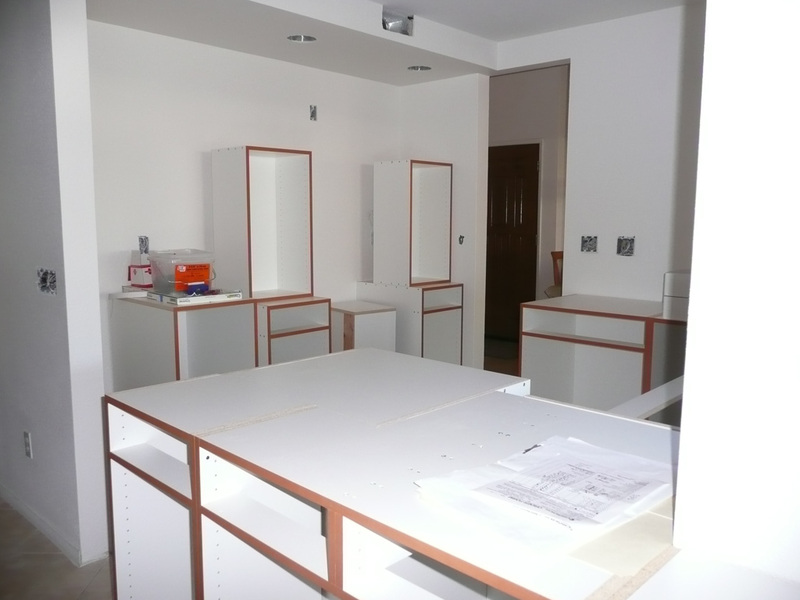 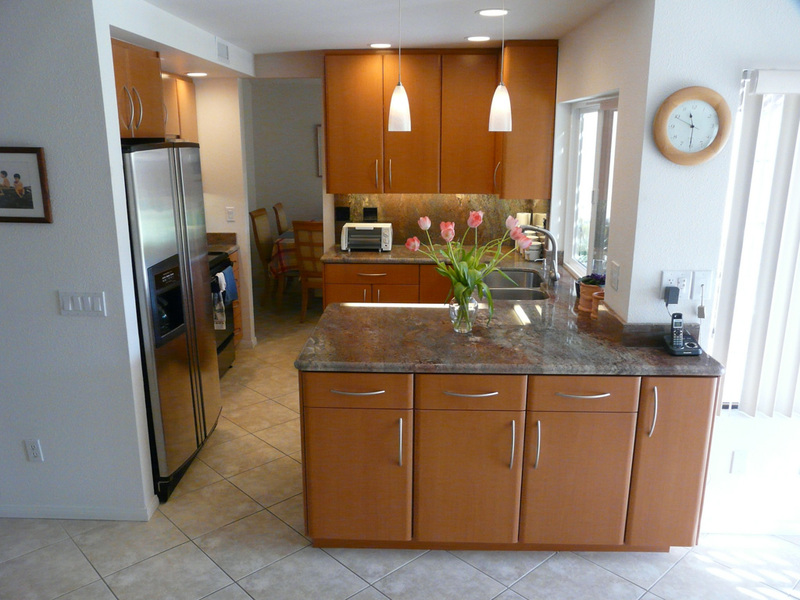 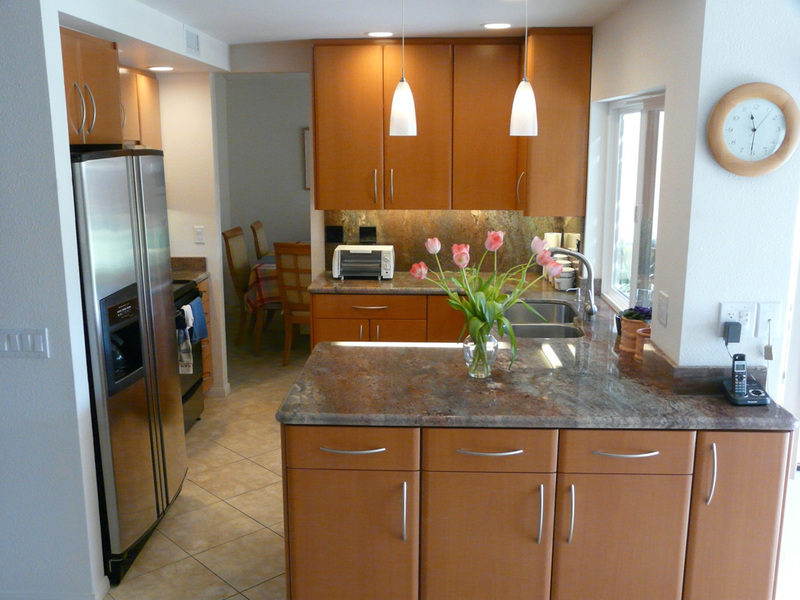 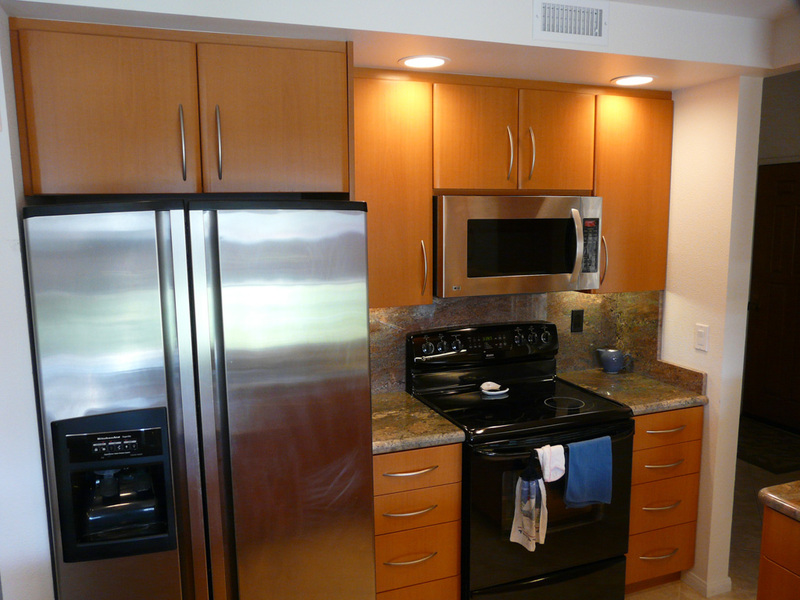 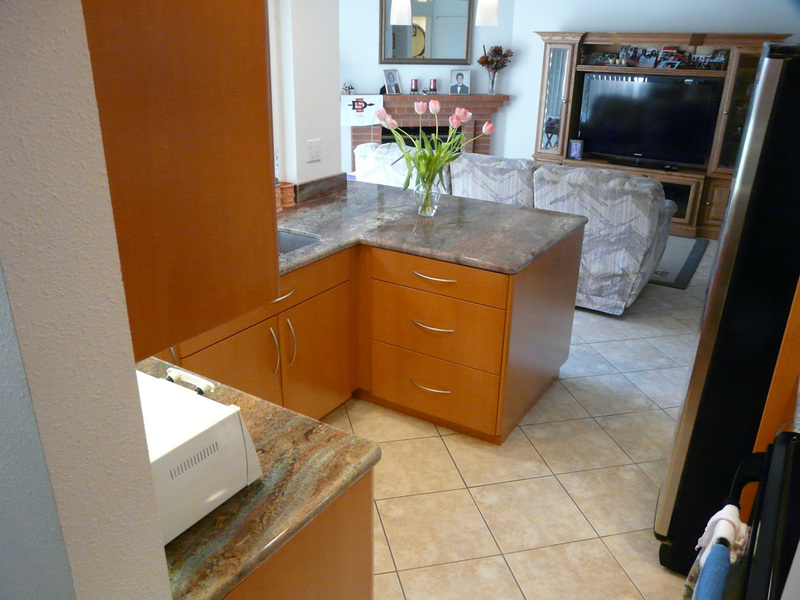 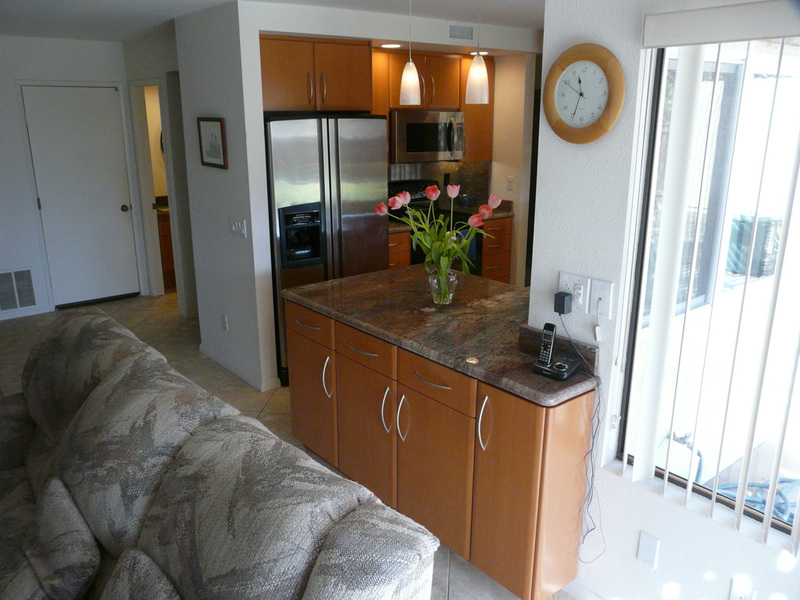 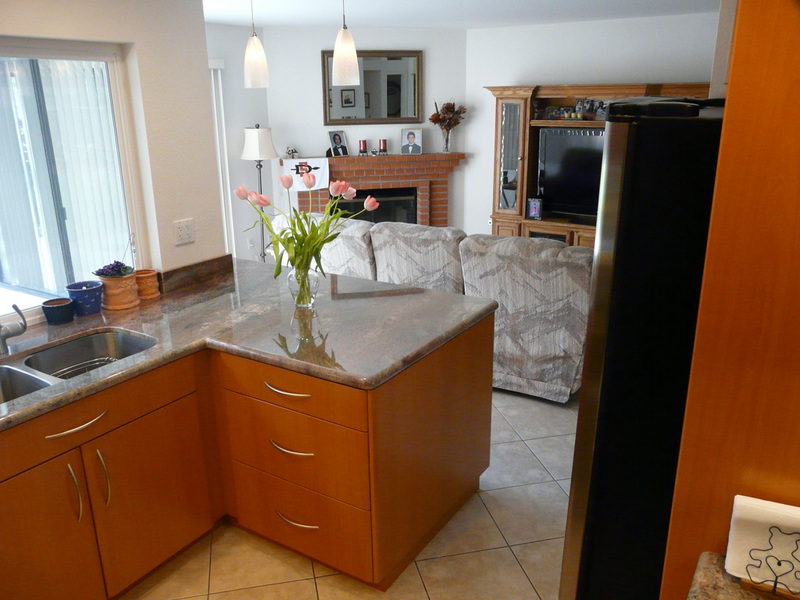 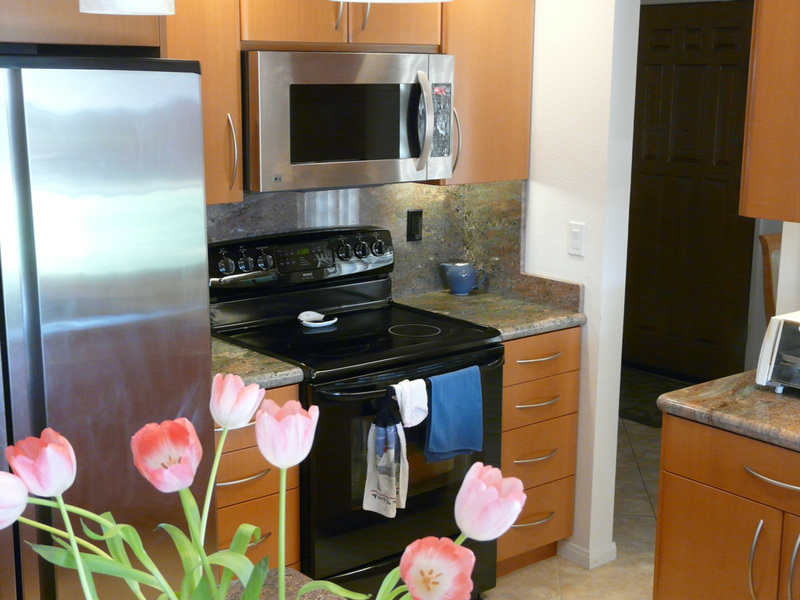 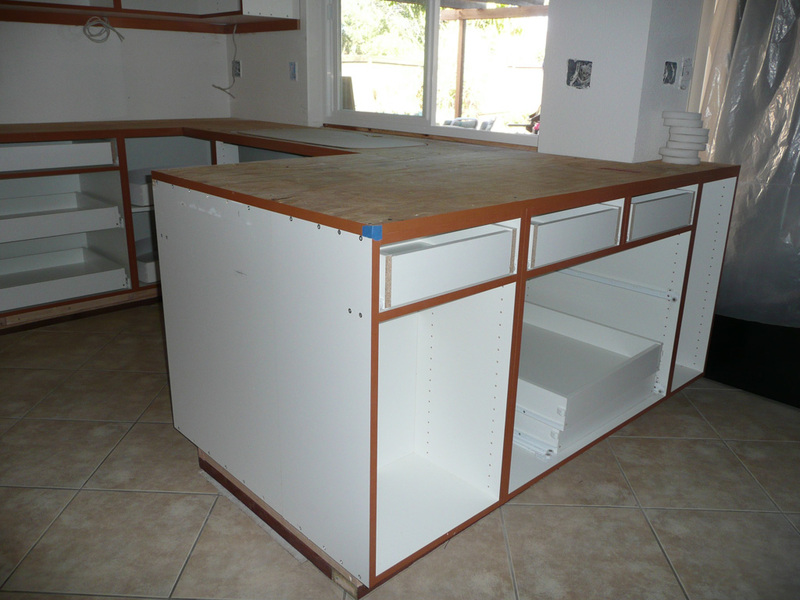 To save costs, we re-used the original cabinets and laminated the fronts with Formica to match the kitchen, then put new Formica covered doors and drawer fronts on to match the kitchen cabinets. 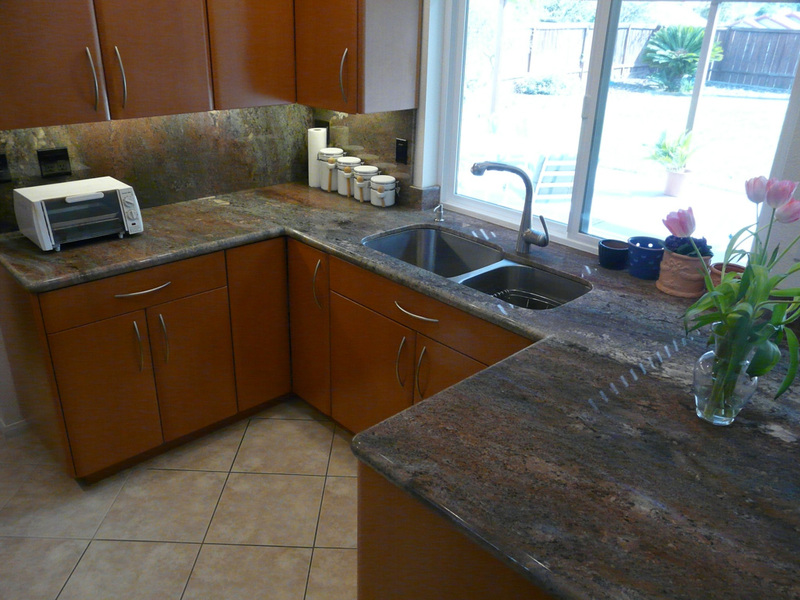 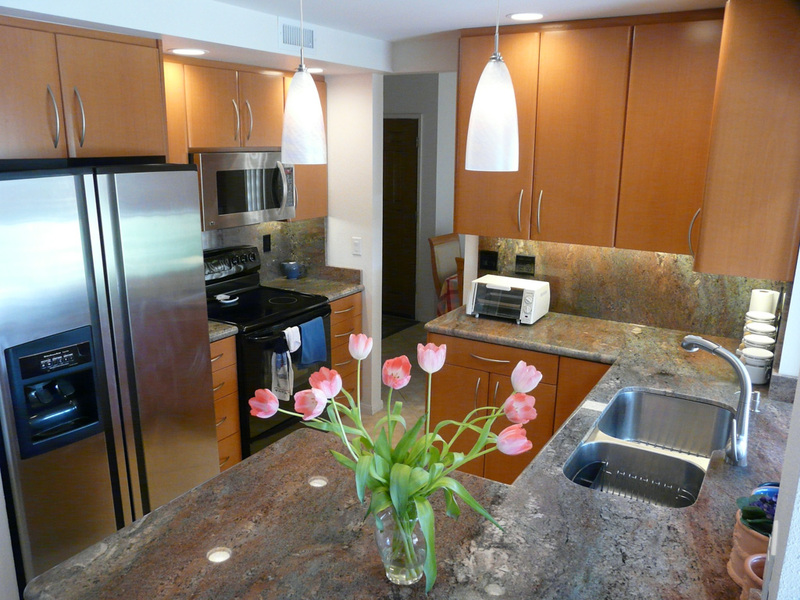 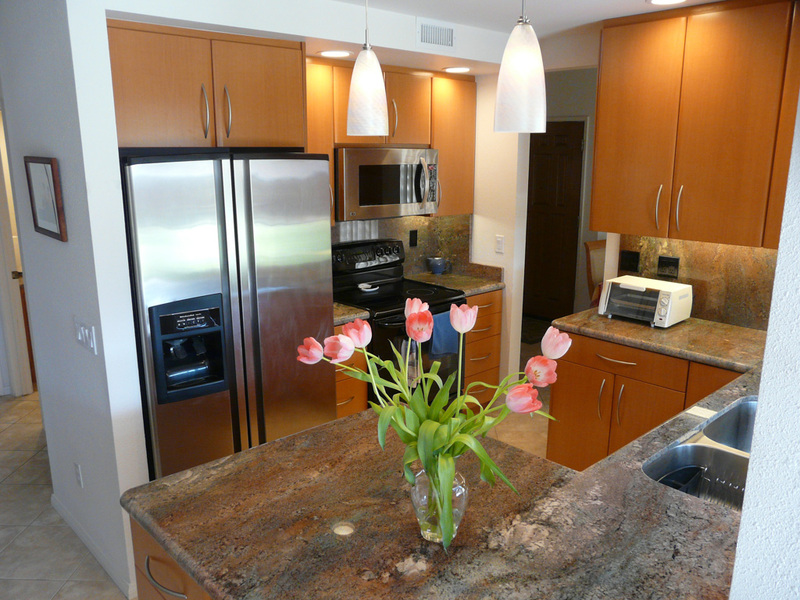 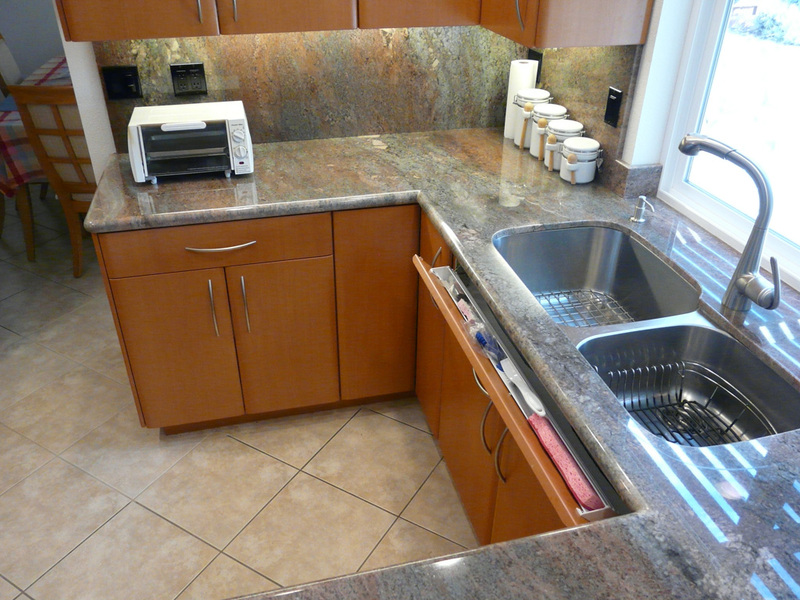 Lastly we changed the counter tops to granite using left over material from the kitchen counter tops.